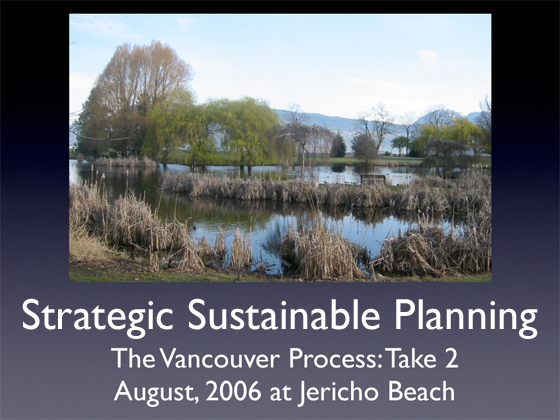 In the summer of 2006, we videoed the second seminar on Peak Oil and Oil Shock Impacts on Cities and Society hosted by the Strategic Sustainable Planning Committee of the Vancouver City Planning Commission (VCPC). Presenters include Rick Balfour (Metro Vancouver Planning Coalition), Julian Darley (Post Carbon Institute), and Bryn Davidson (Dynamic Cities Project). After learning about various powerdown and climate change scenarios, participants met in workgroups to brainstorm solutions and mitigations for various geographical areas around the greater Vancouver metro area. They reported on their results, with engaged responses from other participants. It seems to us this workshop is even more relevant seven years on. Effects of climate chaos have accelerated. What the scenarios describe is well on its way. It is becoming clear that our pattern of community built in an era of cheap energy cannot be maintained, nor can it maintain our society. The baby steps we are taking in new green directions, while meaningful, are too little, too late and what we need to address as a whole society is making the total quantum changes to achieve a soft landing, rather than a crash. This applies to all aspects of society: social, cultural, economic and environmental. We cannot keep attempting to plan along a divided approach to problem solving, but rather must apply a holistic approach. This also applies to cities and social/ecological basins like Metro Vancouver; the disparate policies and missing links in solving big city problems have compounded the dysfunction of our present society, and will only make matters worse in the future. In attempting to raise public consciousness in this area, there are multiple levels that need to be awakened, from personal, to family, village, city and region- from citizen to leaders, bureaucracy and private institutions. Great changes are needed, and while change is feared by many, in this case change needs to be embraced so we may make the best adjustments for our society in creative ways as we adjust to new shortages in everything we now take for granted…. This is not yet another attempt to prove we are doing all the right things already, but to move beyond that to deal with more effective changes, the strategic level of planning required for a soft landing of society. Other interested groups who recognize the need to make the big leap or paradigm shift will be invited to come on board. The goal is to raise consciousness of energy costs and energy shortages impact on cities, but also to help spur on leadership in this area.